Some people dedicate themselves to life-long learning. Some people revel in positioning themselves as no longer able, willing, or interested to learn any more. Learn confidence when you allow learning as an on-going. competence. The reality is we continue to learn and process experiences until we draw our last breath. Today, those who resist, say learning new technology, are often called Luddites – artisans who resisted the industrial revolution. Those with confidence to learn build competence to contribute. People who do not have competence do not feel very confident. Their behavior may mask a lack of confidence with bravado, hostility, or self-deprecating humor. You might see this in a refusal to learn or resistance admitting they do not know – both equally frustrating. Those who lack competence rarely embrace learning because they may feel learning reveals a lack of knowledge others judge as weakness. If 70% of learning is on-the-job then what the employee is open to while on-the-job, or takes a back seat to after the learning opportunity, remains the most critical area for employee and organization development benefits. If 20% of learning happens through interaction and feedback. A healthy work environment needs to include practice of both informal and formal feedback. A Luddite, in the animal world, is lunch. A Luddite in business world, same result, is lunch. A correlation to an ability for your people to learn may present itself in the 50% turnover of the Fortune 500. Here today, lunch tomorrow. A space for people to practice within their workday is critical: you only know what you know when you socialize what you think you know. Growth and development builds employees’ knowledge, skills, and abilities. Learning provides employees new and necessary resources to do their jobs better. With new resources people feel more confidence they can do the job. Growth and development builds organization knowledge, skills, and abilities. When learning applies in situations to practice and develop skills the organization gains through increased motivation, job satisfaction, and, from new-found confidence, the ability to manage job stress. An organization can only develop if people develop. Organizations can only change if people change. The best way for your organization to develop is in an environment that practices learning and developing. Critical to this is the environment to respect making mistakes as critical to learn from and to practice a skill to build mastery and the information link to development. Talent acquisition, recruiting, is useless if the environment retards further growth. Learning fosters psychologically healthy workplaces and healthy is good. Competitors are always happy to each someone’s lunch. That is how they stay healthy. The bear’s gain, is the salmon’s loss. Creating a learning culture creates confidence and confidence builds competence to contribute to your organization’s health. I’m impressed to get a view of animal behavior! There are so many instinct behavior of wild animals and hunting is one of them what they’ve got by born. Thanks for the article. I looked at the picture and quote from the BBC show as an example of a learning environment: watching, coaching, trying. 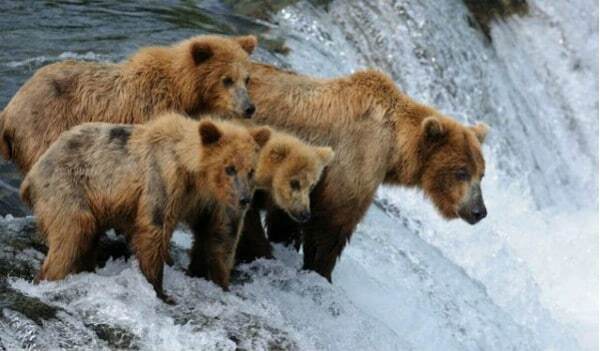 The bear does not take the cubs into a classroom and start a PowerPoint display on catching a salmon. It is in the environment of where salmon are. We are animals, but what might we do in our corporate or community learning to improve the ability to learn and to practice where are? There is an absolute difference between instinct and learning that does separate us from the more base animal families, genera, or species. A second picture I had in my mind were lion cubs play fighting and wrestling that build their skills. Just like us. We can read a great many books on riding a bicycle, but until we get on one we don’t know how to ride a bicycle. I read about an interesting book Games Primates Play that has some compelling looks at how we, today, many years removed from our wandering, skin-clad, forefathers, still sociologically treat each other as current-day primates do.